Benefits under the Seacare Medical Scheme (SMS), Seafarers’ Provident Fund Scheme (SPF), Seacare Sailors’ Home Scheme (SSS) and Membership Benefit Scheme for eligible members are subject to terms and conditions. Seafarers’ Provident Fund (SPF) is a saving scheme for seafarers, established by Singapore Organisation of Seamen (SOS). The aim is to encourage continuous employment and loyalty of seafarers. A Scheme of Administration was set up to govern the administration and distribution of the SPF. To urge more seafarers to come forward and withdraw their funds, SOS had put in more effort to reach out to more members through SOS publications, the maritime community, onboard vessels, etc. In consideration for the benefit and in the interest of the Participants of the SPF – SOA, the Singapore Organisation of Seamen Executive Committee (SOS EXCO) decided to extend the expiry of the SPF – SOA for a further 2 years, from 30th September 2019 to 30th September 2021. (1) This Scheme to effect the distribution of the SPF moneys to the Participants or the proper claimant of the Participants will terminate on 30th September 2021. In view of the amendments, the SOS EXCO would also like to take this opportunity to inform all Participants that the last date of submission for the SPF Balance withdrawal is 31st August 2021. 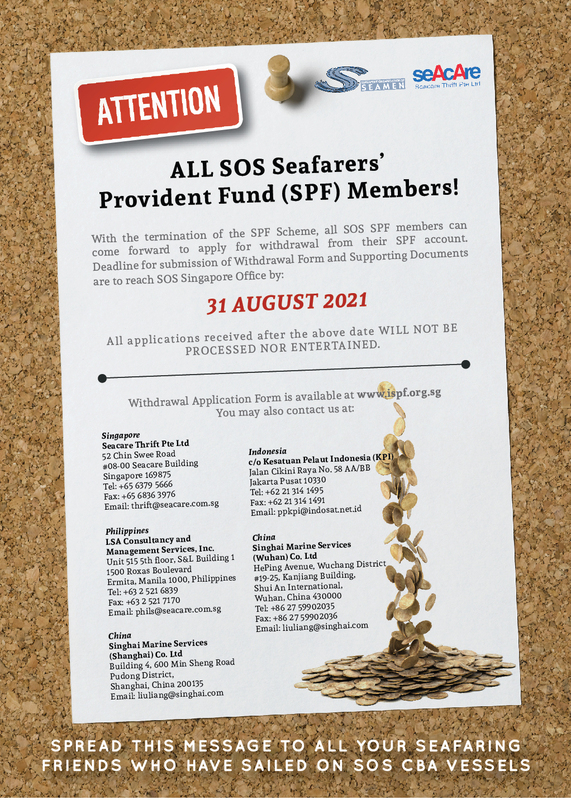 For more information, please refer to the full revised Seafarers’ Provident Fund – Scheme of Administration which is available for downloading at www.sosea.org.sg or contact the SOS SPF Administrator at thrift@seacare.com.sg. WE ARE HEREBY INFORMING ALL SOS SPF MEMBERS TO SUBMIT THEIR APPLICATION FOR WITHDRAWAL. Kindly note that payment to Singapore-based members will be via cheque. For payment via telegraphic transfer, please indicate the Bank’s Swift Code. Please be informed that we will not accept any application forms and supporting documents via e-withdrawal, email or fax. ALL forms and supporting documents must be submitted by post or in person. Applications received without the complete set of required documents will be reviewed on a case-to-case basis and at the discretion of the AC. All applications for SPF withdrawal shall be made by 31st AUGUST 2021. Withdrawal applications received after 31st AUGUST 2021 shall not be entertained.